Shorya Mahanot, a student from Kendriya Vidyalaya, Neemuch (MP) is the "World&apos;s Youngest Signature Style Abstract Artist". Shorya has been winning laurels from the age of three years because of his unique painting style. The painting of this 10 year are sold at the price of 45,000 dollars and has been placed alongside the legendary artists like Anthony Quinn, Burt Young, John Lennon etc. His view is compared in similarity with Sir John Pollock which places him on this world arena of higher appreciation. Solo show at legendary cartoonist, Shri R.K. Laxman&apos;s residence and showered with his blessings. The Guardian, London gave a full-page coverage on World News and wrote "India&apos;s child Picasso" puts on his goggles and takes aim at the canvas 3rd, July 2012. &apos;Amazing Kid Award&apos; given by POGO. At Autism Speaks (an autism advocacy organization founded by Bob Wright, Vice Chairman of General Electric) Silent Auction Donation Breakdown, Celebrity Chef Gala, New York, one of my paintings was auctioned and fetched a cost of $ 2,000 for donation on October 21st, 2013 at Cipriani Wall Street, New York City, NY. (U.S.A.). www.autismspeaks.org . 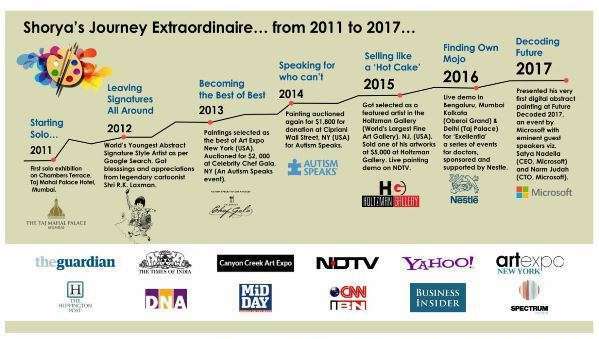 Again at Autism Speaks, another one of my painting was auctioned and fetched a cost of $1,800 for donation on November 2014. Also, being a featured artist at the Holtzman Gallery (World&apos;s Largest Fine Art Gallery) at The Claridge, in Atlantic City, New Jersey, U.S.A. I also sold my painting &apos;Dancing with Colour&apos; for $5000. Every moment is the best actually. Whenever I pick up my colors, I don&apos;t just paint, I play with the colors in such a way that anyone who looks at them feels like they are reading a story. 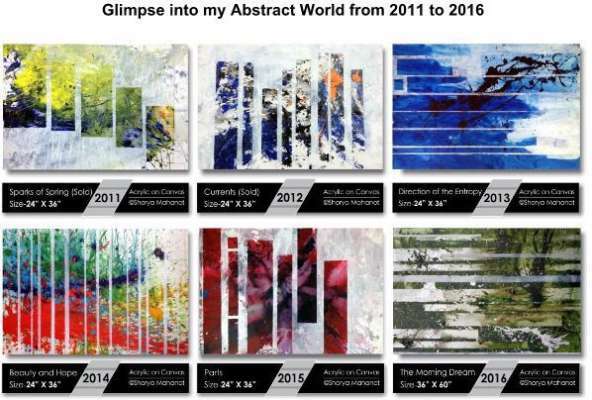 With every painting of mine, the signature style of an abstract art evolves. I work with acrylics in a heavy impasto technique that has been compared to Jackson Pollock&apos;s "drip painting" or "action painting". Like Pollock, I spread my canvas on the floor and compose with my masterful strokes in multiple layers and deliberate consideration of color composition. There are a rhythm and symmetry between my brushstrokes, dripping, and pouring. With all joyfulness of my youth, a magical world is revealed. Whenever I do my drip painting, I look at the world in a different manner. Sometimes a blissful moment opens a window, showcasing a world of colors. The world that is beyond the thoughts of shapes and sizes; a world bursting out with colors. One color gets mixed with another and becomes the third one. At times, it becomes a color that even I can&apos;t name. It is that color from beyond the window and I keep staring at it till it disappears and yet makes sense to me. The world beyond that window where colors appear and disappear makes me feel delighted. Those colors, I can&apos;t get them off my mind and when they get down on my canvas; the world calls that my painting. People compare my paintings and say that I have a &apos;signature style&apos;. But for me, it&apos;s just a beautiful feeling. That is why the best moment for me is when I paint and lose myself in it. I also feel very good when people praise me for my work. I would just like to say that "Don&apos;t be afraid". If you have creativity, then this world is but a canvas to your imagination and success will follow you. Artists should not hesitate to manifest what their heart wants to portray at any point in time.